For anyone currently going in on spring cleaning, KitchenAid and Walmart are here to help you replace any old, worn-out tools with something new-without spending a fortune. 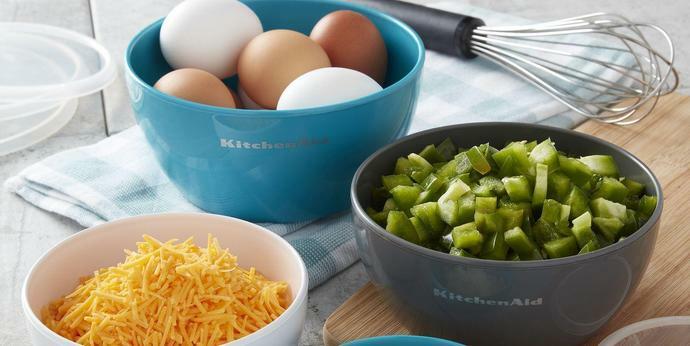 Beginning March 9, Walmart is carrying an exclusive line of KitchenAid cooking utensils and gadgets, all of which are less than $40. In fact, most are under $20. There are plenty of basics, including ladles, shears, an ice cream scooper, and a can opener, plus sets in case you're looking for a bundle. The 15-piece kitchen tool set is one of the best deals-it comes with a slotted turner, basting spoon, euro peeler, can opener, set of four measure cups and five measuring spoons. It costs $39.97 (making it the most expensive batch in the line), $10 less than similar KitchenAid essentials sets (Amazon has one for $50). While the overall price difference for the rest of the products isn't crazy, you will save a few dollars apiece with Walmart's line, compared to similar KitchenAid products sold elsewhere. They all have a clean, streamlined look-everything is black or white, with the occasional teal can opener or mixing bowl with heat resistant nylon handles, stainless steel blades, and dishwasher safe plastic. Shop our favorites below, and head to Walmart's website or stores to see the full collection.